Australia’s wool production is slipping. AUSTRALIA’S wool production is forecast to fall by almost 6 percent in 2018/19 due to the tough seasonal conditions. The Australian Wool Production Forecasting Committee has updated its forecast of shorn wool production in 2018/19 to 322 million kilograms greasy, down by 5.7pc from 2017/18. The continuing dry conditions across most of the country has resulted in a high sheep and lamb turn-off in 2017/18, up about 10pc, the committee said yesterday. This combined with the current tough seasonal conditions are expected to lead to a lower number of sheep to be shorn in 2018/19, down 3.2pc to 74.3 million, and a 2.6pc reduction in average wool cut per head to 4.3kg. The committee estimates that Australian shorn wool production in 2017/18 was 341 mkg greasy. This is 0.3pc higher than the estimated level for 2016/17 and higher than the committee’s forecast in April. It reflects an increase in the number of sheep shorn (+3.3pc) last season compared to 2016/17, which is mostly offset by an estimated 2.9pc decline in average fleece weights. 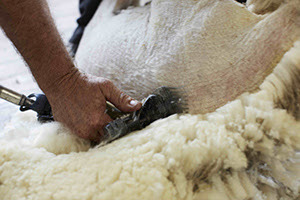 The committee said its lower 2018/19 season wool production estimate reflected an expected reduction in the number of sheep shorn and average wool cuts per head as a result of the dry seasonal conditions across most of the country. Committee chairman, Russell Pattinson said adverse seasonal conditions in many sheep-producing areas across Australia have resulted in a high turn-off of sheep and lambs. The impact of the season can be seen through a 10pc increase in sheep and lamb turn-off last season compared to 2016/17, the committee said. Mr Pattinson said the committee’s first forecast for the 2018/19 season made in April at 333 mkg assumed that normal seasonal conditions would prevail. “That has obviously not been the case with conditions worsening in many wool producing regions across Australia”. Wool production is expected to fall in all states except Tasmania, with the largest reductions expected in NSW (down 8.9pc) and South Australia (down 6pc). How the season progresses over the next couple of months will be very important for overall production levels this season, the committee said. Wool production reductions were greatest in Western Australia (down 8.5pc) and Queensland (down 3pc), while Victoria showed the largest increase (+ 8.9pc) with increases also in SA (+2.7pc) and Tasmania (+1.5pc). The committee said the estimated 0.3pc increase in production in 2017/18 is consistent with AWTA test weight data for the season (+0.6pc) and AWEX first-hand offerings (+2.2pc). AWTA test data for 2017/18 by micron showed reductions in weight of wool tested between 19.6 and 24.5 micron (down 11.3pc) while there was an increase in weight of wool tested between 16.6 and 19.5 micron (+11.7pc) as well as over 26.6 micron (+11.7pc). Production of wool 16.5 micron and finer fell by 10pc last season. The national forecast committee drew on advice from the six state committees, each of which includes growers, brokers, private treaty merchants, representatives from State Departments of Agriculture, and the Australian Wool Testing Authority. Data and input was also drawn from AWEX, wool exporters, the Australian Bureau of Statistics, ABARES, AWTA and Meat and Livestock Australia. The full forecast report will be available on the AWI website at www.wool.com/forecasts from 24 August 2018.